Dozens of law enforcement officers are actively hunting for 20-year-old Kenneth Stancil III suspect after a shooting on the campus of Wayne Community College. 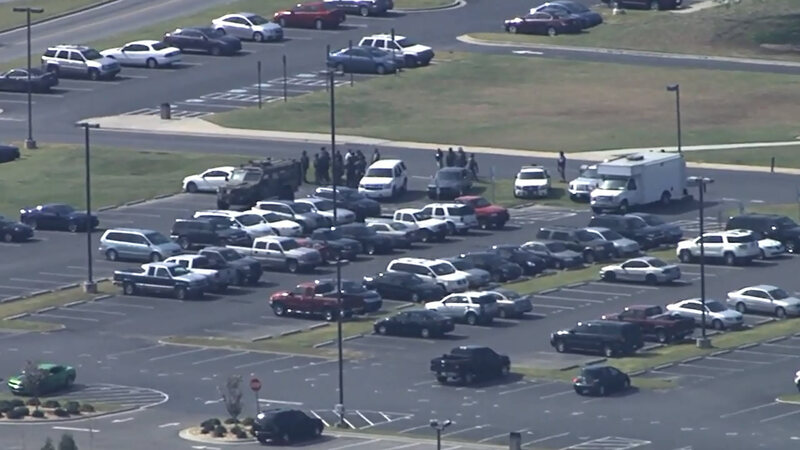 GOLDSBORO, N.C. -- Dozens of law enforcement officers are actively hunting for a suspect after a shooting on the campus of Wayne Community College Monday. They say 20-year-old Kenneth Stancil III should be considered armed and dangerous. School officials said Ron Lane - an 18-year school employee - was shot to death on the third floor of the Wayne Learning Center, which houses the cafeteria and library, shortly after 8 a.m. It happened soon after Lane arrived for work in the school's print shop. "Our hearts are heavy for the loss of a valued employee," said Wayne Community College President Kay Albertson. The incident sent the school into a lockdown situation as teams of law enforcement officers methodically searched and cleared each building on campus and allowed students and faculty to leave. For a short time, authorities thought the shooter might have been cornered in a building and tear gas was used, but it turned out the shooter was not in the building. One student told ABC11 her instructor turned out the lights in the classroom and barricaded the door. A message on the school's website warned of the lockdown saying "This is not a drill." The Wayne County Sheriff's Office said they were looking for 20-year-old Kenneth Morgan Stancil as a suspect in the shooting. "We are actively pursuing him on an open count of murder," said Wayne County Sheriff Larry Pierce. Officials said Stancil is a former student who did not graduate. The school said he was a third-year work/study student who also worked in the print shop - which is where the shooting happened. Stancil is described as was a white male, about 5'11", with a goatee and tattoo over left eye, wearing a blue jacket and light-colored pants, and carrying a long gun. Officials said they couldn't immediately say if it was a rifle or a shotgun. Deputies said they were working to get a current picture of Stancil who is believed to have fled the campus after the shooting. Local, state, and federal law enforcement officials were all working to find him. Alberton said the school plans to bring in teams of counselors for students and faculty who need to talk about what happened.